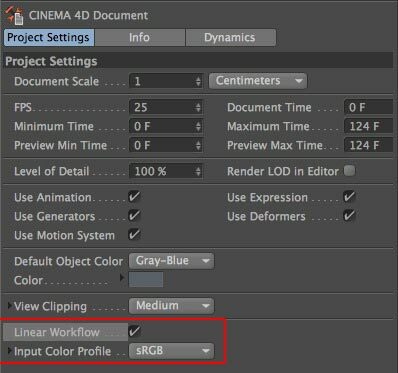 Linear Workflow is a relatively new feature for Cinema4D. Before the introduction of Linear Workflow in C4D Release12 it was only possible through the use of third party plugins such as DeGamma by The Third Party. This article aims to explain the concept behind Linear Workflow (LWF) and in the process look at the correct techniques, file formats and procedures when using LWF in your studio pipeline. The information in the following post comes from an extremely informative and helpful document which was written by Philip Losch. Philip is one of the mastermind geniuses responsible for Maxon’s Cinema4D. I’d like to thank Philip for giving me permission to use his material here. Which of the two colors at the bottom resembles the top one the best? The surprising answer is: not the right one. The left one should – depending on your monitor – be pretty close. At the top is a regular pattern of black & white pixels. At the bottom left the grey has a value of 192 (= 75%) and at the bottom right of 128 (= 50%). Now… shouldn’t an even mix of 0% black and 100% white pixels blend into something like the bottom right grey of 50%? At least that’s what we were taught in math: (0% + 100%) * 1⁄2 = 50%. Unfortunately monitors do not work that way. The do not show colors linearly. The center of 0% and 100% is not 50% on a monitor. Monitors display the incoming signal with a so called gamma curve (actually it is even more complicated, but we’ll stick with this easier idea for a moment). From left to right is your input image color. From bottom to top the actually shown color. So if the image color is 50% gray the real color shown is only about 18%. And to have a 50% gray displayed, you need an image value of about 75% (you can see the red dotted line). As mentioned above the reality unfortunately is even more complicated. Monitors have so called ‘color profiles’. A color profile is such a curve definition – however with a possible interaction of Red, Green and Blue components. A color profile can do anything – e.g. it can substitue red for 50% green, it can add red and green and assign it blue… As an image looks widely different on devices with different color profiles many image formats allow to embed a colorprofile that ‘records’ under which conditions an image was created. Most images nowadays are created with a so called sRGB color profile. sRGB roughly looks like the above curve and affects Red, Green and Blue components independently. But isn’t it a dumb idea to build monitors that don’t show colors linearly and not “how they really are”? The answer is yes and no – unfortunately our human eye sees light intensities in a nonlinear way too and is more susceptible to certain ranges of intensities. This would not matter as much if we had displays with unlimited color resolution (floating point or ‘HDR’ displays), but monitor technology for the most part is still stuck at 8 bit color depth per channel (or sometimes 10 bit for medical displays). So now that we know we have to make do with this existing technology, we have to look for a better solution. Actually, there is the possibility to correct this with software – this is where Linear Workflow comes in. The main problem of renderings created without LWF: lights are overblown and colours mix badly (‘unnaturally’). While the artist can compensate for parts of it by adjusting lights, falloffs, colours etc., this is only possible to a certain extent. CINEMA 4D is clever enough to offer you a “one button” solution – and by default LWF is automatically activated in new scenes. If you are wondering where abouts you find this one button solution. Open the project settings (Control-D or via the Edit Menu). Step 1: Before rendering all so called ‘assets’ (which are any colors, bitmaps or external references) are transformed from their colorspace (or sRGB colorspace, if they do not have a colorspace assigned) into linear colorspace. Step 2: The render engine does all its calculations in linear colorspace. Step 3: The rendered image is transformed from linear colorspace into the colorspace that the user chose for image output. The colorspace –if the image format permits- is embedded into the image. There is no rule without exception: if your texture or colour is in a bump channel, alpha channel, normal channel or displacement channel the ‘raw’ image data is used (so step 1 is omitted). The reason for this, is that other applications like Z-Brush expect their images to work a certain way and contain direct height information (so e.g. black equals 0m height, white equals 100m and 50% gray equals 50m). You can also think of it this way: all material channels that don’t have anything to do with direct material colors (bump and normal channels change lighting only, alpha cuts out parts of the material and displacement changes the elevation) do not undergo this first conversion step. Step 1: A sphere’s texture is an 8-bit image with no color profile embedded. As the image has no color profile C4D assumes it is using sRGB (the the most commonly used profile). Let’s also assume the sphere’s texture is 75% blue. C4D now transforms this color from sRGB colorspace into linear colorspace. So the value of 75% becomes 50%. Step 2: C4D does all lighting calculations linearly (and this is why the images will be so much superior – there is no color ‘distortion’ happening anymore). Let’s assume a pixel is 50% illuminated. So we get 50% * 50% = 25% blue. Step 3: The calculated image is converted into output color space, which in this example shall be sRGB again. Our 25% become roughly 56% blue after transformation by applying the sRGB curve. So the end result for our pixel is 56%, while in traditional rendering it would have been 75% * 50% = 37%. And so they used LWF and lived happily ever after..
Not so fast! If you thought we only had to deal with !%§!$ hardware I have to disappoint you – as we’re also unfortunately living with !%§!$ software! It will take years and years until most software can properly handle colour profiles, linear workflow etc. Fortunately Cinema4D, AfterEffects and Photoshop (and several modern compositing applications, for example Nuke) can play nice together – as long as you choose the right settings. Let’s go through the limitations and problems step by step. The operating systems now have some support for colour profiles. While OS X does a pretty good job evaluating image profiles, Windows 7 works for some image formats, older versions of Windows do not evaluate colour profiles. 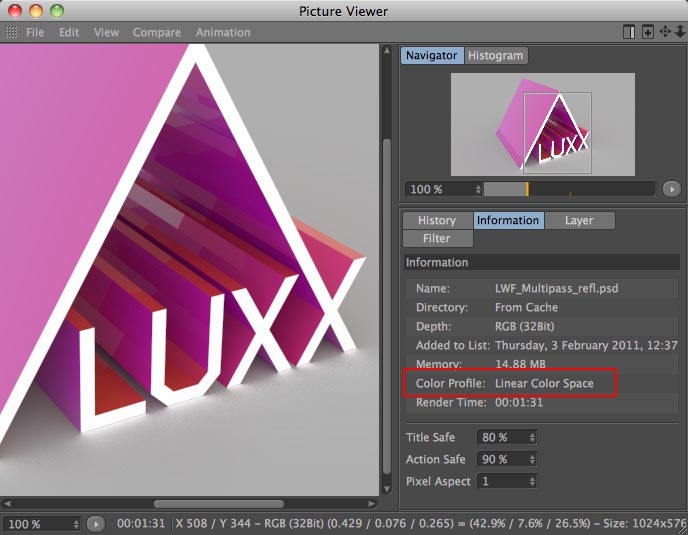 To view images, it is best use C4D’s Picture Viewer – as it always supports colour profiles. If you check the View menu, you will see there is an option to view the image with the Colour Profile or without. Select the Information Tab, and you can see the Colour Profile assigned to the image currently being viewed. Lots of image formats do not support embedding of color profiles. 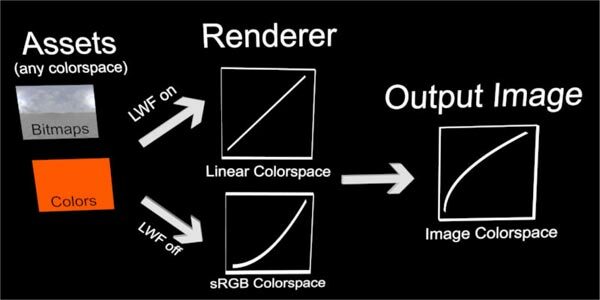 While this is no problem when you render images to sRGB colourspace (as most applications naturally assume this) it becomes a big problem especially in combination with Multipass renderings and linear workflow where the image colour profiles must be linear. 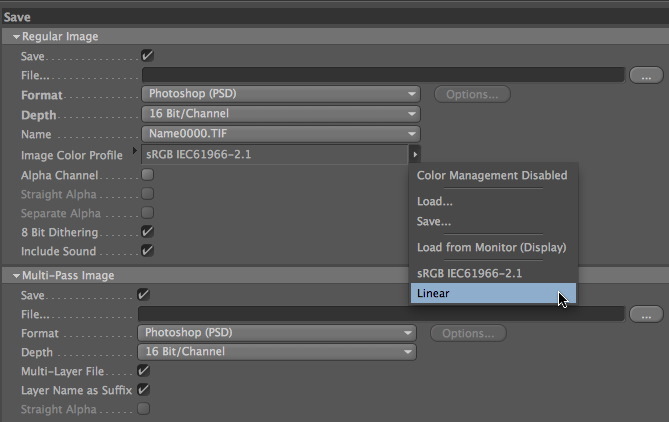 You can choose your desired output Colour Profile in the Cinema4D Render Settings – Save options. A specialty applies when you use 32-bit images for in- or output. By definition a 32-bit image is always saved in linear colourspace. C4D takes care of this for you automatically. If you choose 32-bit output the colour space option for the saved image is automatically disabled and linear colourspace is used. Photoshop reads and writes regular images without any problems. Single-File Multipass images are also handled correctly with one exception: if you render without LWF and output to 32-bit Photoshop can no longer composite the image properly. This comes from the above mentioned limitation that 32-bit image formats do not contain any colour profiles. The most important setting in AfterEffects that needs to be adjusted is “Linearize Working space” in your project settings. If you render with LWF in C4D this option needs to be enabled; if you render without LWF in C4D it needs to be disabled. The reason for this is: Multipasses ‘outsource’ calculations to a compositing application. This only works though if the compositing application does the same mathematical calculations as the render engine, which means the colourspace they’re operating in needs to be identical. Once you have Colour Management enabled in your After Effects projects, when you select a footage item, it will show you the Colour Profile in the top of the Project Window next to the thumbnail. You can check here to ensure the profile is being read correctly. Try to use 16-bit colour depth or higher to avoid the occurrence of banding – as multipasses sum up multiple layers and then have the result transformed into monitor colourspace 8-bit usually isn’t enough. For special passes like UVW data, Normals maps etc. 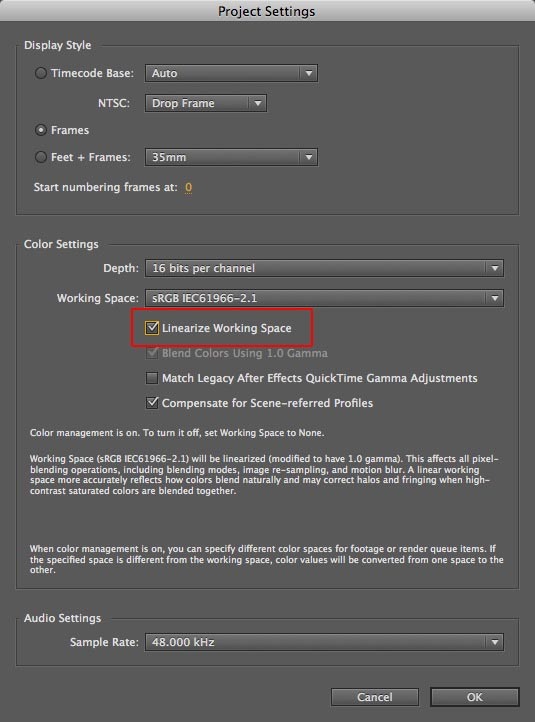 activate the setting “Preserve RGB” in the “Interpret Footage” dialog to use the “raw” uncorrected data (not influenced by any color profile). So there you have it. Linear Workflow with Cinema4D and After Effects in a nutshell. Hopefully this article helps to clear up any questions you may have had regarding LWF and C4D. Once again, huge thanks to Philip Losch for originally preparing this information and allowing me to post it up on helloluxx. You have made this so much easier to understand. Great post! Wauw thanks for the detailed explanation! After compositing my 3D renders in After Effects what is a recommend output format for bringing the clip into my editing application. I always noticed that when I would render to a QT movie and bring it into Avid that the gamma would change. Should I just be rendering back to a PSD sequence and importing that into Avid? @Shawn If you render to a lossless codec after comping then you shouldn’t notice a gamma shift. Although gamma problems are notorious with QT. Do you get the gamma shift only when rendering to the Avid codecs? If you cannot solve the gamma issue then use an image sequence that works well on the Avid, but the gamma issue with quicktime should be solvable. Thanks very much for this Tim. So in C4D do you set the color profile for your rendered images to “Linear” or “sRGB”? And do you normally render 16-bit PSD? @jdpeterson I would most probably use 8bit sRGB PSD if I was rendering without multipass (maybe 16bit if my tests looked like some banding was appearing). If I was rendering multipass then I’d render 16bit Linear PSD. Awesomesauce Tim. Really great article. Still nto entirely clear on why you would ever choose 32bit or 16bit. From what I gather it would never really make sense to use 32bit. Is that correct? @Aaron 32bit has plenty of advantages when compositing, you are working with floating point data, so there is so much more information. You can push and pull the data to show super whites and blacks without crushing the other end of the tonal range. Using blurs etc on 32bit will also give you beautiful bright highlights from the super whites, whereas using a lower bit depth will normally start to become muddier looking. Very useful. Great reference. Out of curiosity, what format do you most often utilize when going the c4d->AE workflow? @Colin_movecraft I tend to use 8 / 16bit PSD most of the time, purely because the file size tends to be smaller than TIFF yet it is still lossless. in the C4D to AE workflow, what color profile is most often used when rendering? @cameradan If you are not using Multipass then I would suggest using sRGB, if you are using multipass then you must use Linear and comp in Linear space too. As for file format, any file format that supports colour profiles and 16bit (if you work with multipass). I tend to use PSD or TIFF sequences. Hey thank you this is a very good explanation…. Awesome! Altho this subject can seem a little dry, basic knowledge of LWF with improve renders, work flow and consistency dramatically. TIm, all the reasons you gave for using 32bit sound awesome, but you followed it up by answering another post that you typically use 8 or 16bit PSD files when you render. I am wondering why don’t you use 32bit given the benefits you have outlined? Thanks again and sorry to be a pest. @Aaron I do sometimes use 32bit, but most of the time I find the file size too large to warrant the extra space for the benefits it offers. With stills it is definitely worth it, with hundreds of frames of multipass renders it is a different story! Saying that, it would make for more scope in comp. What a timely piece. Gamma is a somewhat difficult topic to find good information on. I’ve just gone through a couple of days sifting the web, and doing tests here and there to sort it all out. Your post validates most of the conclusions I was getting. Many thanks. Thx for this great tips! I have one issue that comes up when i change my working space in AE from none to sRGB and switch on the Linearize Working Space checkbox (my images are sRGB). a masked solid that i use in add-layer-mode is no longer “burning” the colors underneath as i wanted to. also none of the other layer-modes achieves such an effect. is there a way to still get this “add” effect that i got withoug LWS? @Daniel Composite modes will look different and Add will not have the same blown out feeling. The composite modes should blend more naturally because the layers are actually added mathematically correctly. When you use Add it is has the effect of combining light values from two images accurately, similar to a double exposure. This doesn’t help when you want the old behaviour back though! The new blending is something you will get used to and it will help make your composites look better (although that is of course a matter of personal taste). If you want the old way, don’t use Linearize Working Space, I don’t think in Ae there is a way to create non-linear light comps within a project. It is all or nothing. In a node based compositor such as nuke this may well be possible..
Hi tim, thank you very much to share your knowledge with us, really helpfull ! All is clear now, but should i check “preserve RGB” for the DOF pass ? Very good explanation of the LWF issue. I am going to test it right away. Holy Smokes! I am so happy right now, i always wondered why do multipass doesn’t work right in after effects after i upgraded to R12. Turns out all i have to do is linearize working space in AE. Thank You So much for the info Tim, You just saved me countless of hours. Cheers Clappers, that’s the best run-through that there’s been so far. Nick’s only covered the Cinema 4D Half, but renders are always going to be taken into AE so thanks for including that. UOAH…..very nice explanation how the whole thing works…. I still didn’t understand wich is the perfect (!) workflow to manage multipass render. In my studio we use calibrated eizo monitors and sometimes multipass renders in photoshop doesn’t look like in c4d picture viever. I’ve tried to figure out wich is the best way to solve this problem;render multipass with lwf in 16 bit, open in photoshop with its linear color space, apply a 2,2 gamma and then assign (assign not convert) a srgb 2.1 color profile. The result is quite similar but sometimes, especially with really dark or light areas the image isn’t the same that the picture viewer (or the same tiff rendered without multipass and with srgb2.1 color profile), i can’t understand if its my fault, different eizo calibration or something else…. Basically I do understand it but when I apply it I’ve some problems. I use c4d for ArcitectureVizualization and since I had the R12 version I started to use it with the LWF on. Setting a normal scene I put the Sky Object, eventually some Lights where is necessary and then I turn on GI. ColorCorrection with a 2,2 Gamma (AND HERE COMES THE ISSUE!) and finally LWF with RGBs. So what happens it’s that all of my textures seem washed out! Despite LWF gets c4d scene into a linear space I do apply 2,2 gamma because my monitor (Ws 7 and Vista 64 bit) has a 2,2 gamma and by default GI gamma is 1. What do I have to do to work in linearspace and to have a right monitor result? @Ross From your explanation it seems you are enabling LWF at the end of your process. It is important to use LWF through out the process, if you enable LWF after creating all your materials and lighting then it will look washed. LWF requires less light to look good. I wouldn’t be adding any gamma adjustments either. LWF will adjust the gamma as part of the process. You should also realise that any older (non-LWF) scenes will need reworking to look good with LWF. You cannot just switch it on and expect good results. So if you have textures that you have made in older scenes they may need to be tweaked to look correct again. Any lighting in older scenes will also need adjusting. Also take a look at any bitmaps you may have used in materials and check that they have their colour profile interpreted correctly, most likely they are sRGB. Despite LWF gets c4d scene into a linear space I do apply a ColourCorrection with 2,2 gamma since my monitor (Ws 7 and Vista 64 bit) has a 2,2 gamma and by default GI gamma is 1. The issue is that my textures seems washed out! In regards to color banding… I’m using a Danel shader and when I render in the prespective view… everything looks fine. but when I render to the picture viewer color banding appears. I’ve tried both 16bit and 32bit output and still. I’ve also increased the shadow map to 1500×1500 on the one light in the scene.. Suggestions? I’ve tryed to follow your suggetions, but without any result. If it’s not a problem, i’d like to give to you (and anyone who would like to try) a link from one of my recent work. It’s just a render of a small part of the whole work. I didn’t read of any problem in linking files, but feel free to delete this post if i’m breaking some rule. It’s a zip with 3 files;a merged file from c4d (color profile:sRGB IEC61966-2.1),a linear multipass and a converted multipass with a 2,2 gamma applied. As you can see the dark ares in the multipass are different from the merged tiff. Hope this discussion could be usefull for everyone. Thanks and sorry form my english. @Vitta sorry I haven’t had a moment to even look at your file.. I switched off the Colour Correction with the 2,2 gamma. This CC had washed out my textures now it works fine. adding GI and ColorMapping later. Very nice and usefull blog. Thanks for posting this Tim! As always, easy to follow and extremely helpful! (with linearise working space ON) then the image must be ‘converted’ in a 32bit comp by adding an ‘exposure’ effect (from Effect-Colour Correct-Exposure) & changing the gamma setting to .454. This will make the final image look correct in video space. – ie- like an normal sRGB image. .454 is the inverse of gamma 2.2- without this the image will look horribly washed out. I use 32bit renders inside 32bit comps all the time as it gives immense exposure control & allows you to always have highlight & shadow detail available that is otherwise lost in 8 & 16bit renders. As a side note- this method is also useful using VrayforC4D too- although I do notice some issues when rendering on a mixed renderfarm (Mac & PC) using Net-Render. I’m not convinced that Net-Render is doing everything correctly in terms of providing images in linear space or correct embedding colourspace profiles- must test some more! @MarkD I’m not sure I have that problem. I’ve comped 32bit EXRs in 32bit projects and as long as everything is setup correctly I haven’t needed to add the exposure effect. Perhaps you could post an example.. Here’s a simple scene I made that shows everything working correctly for me. nearly quit browsing when I at last found your site! THX ! Still have got a problem if I convert an illustratorfile intor shapes in AE. The colour changes. Is there an profile or option in Illustrator which I’ve to choose to solve that problem. @titus_fx1 I’m not sure how illustrator treats color profiles, but converting them to shape layers adds a new step too, best to contact Adobe for the answer to this one! It change when i choose the linear workflow and convert the illustratorfile to an shapelayer. Thank you for the dedicated focus on LWF. It was mentioned on a tutorial somewhere, but without a breakdown of reason. Thanks for the article. I was actually wondering if C4D is capable of adjusting sRGB bitmaps and converting them internally so it works with LWF and I finally found my answer. What about After Effects. Is After Effects able to convert my sRGB bitmaps (various textures, no 3D renders) correctly if I work in LWF? We tried out LWF in AE but found out that some effects (e.g. broadcast colours) and some images (Illustrator) produced artefacts. I personally didn’t see a lot of advantage to use it in AE if there wasn’t heavy 3D render comping involved. Hey Grischa, as long as you are using Colour Management and interpreting your images correctly then they don’t need converting. You can use any profile in a LWF the results will look different depending on the color profile (but that is same with or without LWF), you still need to ensure the application is reading the color profile correctly. If you need to change a colour profile then use the Color Profile Convertor effect, this will allow you to move your colour space from one profile to another. As far as advantages to using LWF, if you are comping visual effects onto live action plates the linear method should theoretically give you more natural looking results, with a lot of motion graphics it may not give such obvious advantages. It’s always a good idea to use colour management, whether you choose to linearise the working space or not is a personal choice. Thanks Tim for clarifying this. This is quite an intense topic and you helped me a fair bit to understand it better. I am probably deciding on a project basis if I want to go with LWF until all effects in my workflow are supporting it. Great tut and blogs! Thank you! I have a question thouh regarding the linear workflow method. Everything is crystal clear. The project is set to linear workflow (I have never changed it), 16 bit psd file for file and miltipass render. C4d is set ti linear work flow in the render settings as well. I check the images in picture viewer (shift r) and the img looks fine. Then I render out and import to After effects. For first look it is way darker, then I set the AE project settings to sRGb and to linear workflow, 16 bit. The img gets brighter but stil not the same. What could be the issue? Did miss something? What is interesting is the RGB img looks fine. It looks like the C4D picture viewer render, but the comp file what C4D generate is way to dark. Thanks for all of the good info. I usually run into problems when working with client supplied RGB and then especially during supervised sessions. Example would be, render out a plane, luminance channel 50-100-200, let’s say client supplied values. Bring that into AE, 32bpc, srgb space comp, all looks well…info pane reads 50-100-200. Flip it into linear space? New values read 8-32-147. Client says, “hey, can you show me the value for that color?” They don’t match now, well at least in the info pane. So now they say, ok, let’s add a new line of copy. Make it 50-100-200. Well, that obviously reads 50-100-200 but the color is much brighter than the 50-100-200 that was brought in from AE (that now actually reads 8-32-147) Whew. So here’s where I normally excuse myself, get a cup of coffee and wonder if it’s too late to go to law school. Any suggestions would be greatly appreciated. (If anyone has suggestions on this, maybe next we can talk about incorporating LogC Alexa green screen footage??) Thanks so much. LWF has tripped me up a few times when rendering multi pass in C4D for After Effects. Thanks for the step through on AE settings. Saved me a bunch of time. So C4D has a “sRGB” profile and a simple “Linear” profile either can be used during LWF. However AE only has “sRGB” that is “linearized”, but no simple “Linear” like C4D. What’s the difference between rendering out of C4D something that is “sRGB” or simply “Linear”? Since AE doesn’t have a simple “Linear” profile won’t you want to render everything out C4D with an “sRGB” profile (unless your are compositing in something other than AE)? Wow this confusing. 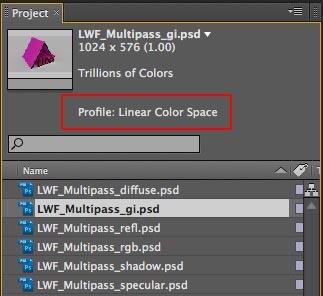 @Chad If you are using LWF in C4D and want to render multipass, then you must use Linear Color Profile for the multipass renders. You must also enable Linearise Working Space in AE. Normally the C4D renderer will composite all the passes together as it renders,and you will see the ‘flattened’ result as your final rendered image. If you work with MPass rendering, what is happening is that you are taking over part of the C4D renderer, because you’re compositing the passes in AE. This means you have to use the same color space for compositing, internally in C4D with LWF active this means the composite is in Linear Space, therefore you must use Linear Working Space in AE too. What would be nice is if we could specify an AE comp to be in linear space or not. So we can choose this on a per comp basis rather than project wide. Excellent explaining! Too bad it isn’t explained as well as everything else is in the C4D help guide. Up till now I had been doing it slightly wrong I guess, so thanks for the help! I have 1 last question though… How do you prep textures/pics for LWF in C4D? Do you simply add an sRGB profile in PS? Or do you have to convert your images to 1.0 gamma? Or both? Or does it matter? Thanks again Tim! @Chad Thanks, glad it made sense. For images you use in C4D they will be interpreted as sRGB. You can change the default interpretation in the document settings. sRGB makes most sense though as it is the most commonly used profile. You can change it on a per texture basis too, you have to open up the bitmap options for the image (click on the image in the material channel). You only need to do this if you’re using an image that does not support embedded profiles and you know it is not sRGB. As long as you interpret the image profile correctly then C4D will do all the LWF stuff under the hood. The solution here is to always try and use file formats that support embedded profiles and make sure you embed the profile when you save it. This way C4D will simnply use the embedded profile. If this is missing it will assume sRGB (or what ever you set in the document settings as default color profile). Thanks for this post, I have one question regarding multipass and Linear Workflow. If you’re creating a solid or shape layer and linear workflow is enabled? Is there a way to accurately predict the colour inside After Effects? On a recent project, (http://www.fugidesign.co.uk/Brit-Asia-Rendzvous.html) I rendered everything from C4D using Linear Workflow, along with an object buffer so I could composite a new background in After Effects. In After Effects, I set the the colour profile to Linear and the render all came in fine. However, when I used solids or shape layers in AE, the colours did not match the original visuals. In the “Rendevous” project link above, I needed to composite some animated circles on the floor and have the C4D render sitting on top of them, I input the RGB values from the client’s branding, but when using Linear workflow, the colours where lighter, which I kind of understand now after reading your post. To fix the problem I ended up importing a still of the client’s colour swatches and using the colour picker to sample the colours. So, If you’re creating a solid or shape layer and linear workflow is enabled? Is there a way to accurately predict the colour inside After Effects? @Phil I think this is an inherent problem in many areas of AE. There are also quite a few effects, both native and third party that do not show a true representation of accurate colour when using LWF. I hope this addressed in the future as you know it can be a PITA! AE can’t guess if you want to input color values in a linearized scene-referred space or in a gamma encoded space (sRGB). You can apply the “Color Profile Converter” effect to solids, text and shape layers. If you set the Input Profile to sRGB, it will convert the gamma encoded colors to linear color values. You can sandwich non LWF plug-ins between this effect also . First convert from “Project Working Space” to sRGB, apply the non LWF effect and convert back from sRGB to “Project working Space”. Hope it comes in handy sometime. Thanks for the most concise article I’ve found on the subject of LWF for C4D. Do you know of any way to compute with LWF enabled in cinema then convert to sRGB to work with in photoshop? When I take my final 16bit multipass (still) image into photoshop is has a Linear Colour Space profile. When I convert or assign an sRGB profile in photoshop the “beauty” pass remains as it did in Linear Colour Space (and C4D picture viewer) whereas the multipass gets either completely blown out (when converted to sRGB) or looses brightness (when sRGB is assigned). In either case, I am unable to recuperate the lost info by applying inverse curves. I like the final output I’m getting from rendering with LWF enabled, but if I can work with the image in sRGB working space. If you could shed any light on this it’d be greatly appreciated. I have searched high and low for a solution to this. The best I have at present is to convert to sRGB, use the beauty pass in conjunction with the blown out multipasses. *should mention its for arch vis, and I do a lot of post work- collage, effects, etc. So half the work is 3d and half photoshop. Hi Scott, Unfortunately I don’t think there is a solution to your problem. You will need to comp the multipass layers and flatten before converting to sRGB. Keep a copy of the layered linear file so you can grab the layers to enhance your sRGB file or return to the full layered version at a later date if needed. Once flattened the linear file will convert to sRGB and retain colour accuracy. Perhaps keep the layered linear PSD and use it as a smart object in an sRGB PSD file, I’ve never tried this and have a feeling it won’t work, but might be worth a try. there are some steps I didn’t understandcause I’m starting with multi-pass in C4D (I’m a Maya users) . 1- In C4D (that work natively in linear workspace) so all you passes will be in linear color space, right? Even if your Image Color Profile 8in C4D still setted (default) on sRGB? 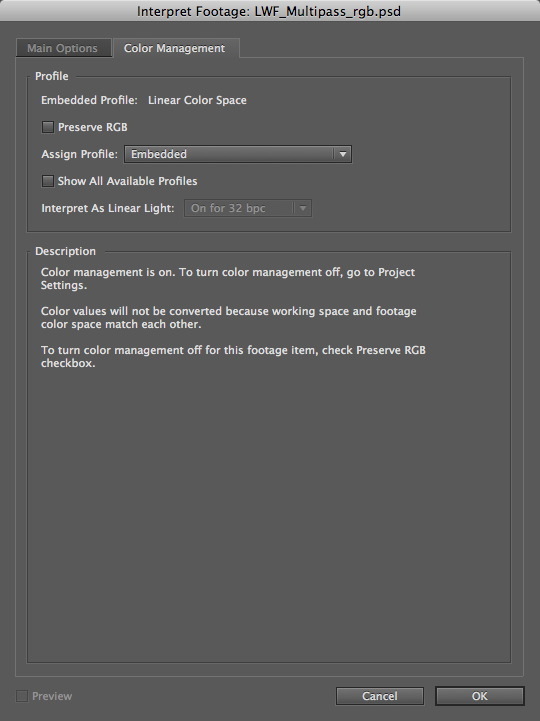 2 – In AE (CC) if I select a pass rendered in c4d it show: sRGB… (linear) and not Linear Color Space. @Duca If you work in C4D with Linear Workflow active and you have images used in materials etc, C4D will correctly interpret the colour profile. If the file format doesn’t support embedded colour profiles then C4D will presume sRGB. This is the default which is defined in the document settings, so you can change this — but sRGB is a pretty good guess for most images. You can also change this on an image by image basis in the bitmap shader settings. It will use the document default but you can override the default colour profile if you know the image uses a different colour profile. Basically this is how C4D manages colour on images that are input into your scene. When you output you can specify the colour profile output in the render settings. If you use multipass you should output to a linear profile. When you bring this into AE it is interpreted as sRGB (linear). sRGB has a gamma curve of 2.2 to better display colours on screen, sRGB (linear) is the same colour gamut without the gamma curve, so the curve is linear or 1.0. So, which setting to set my multipass render as Linear? I ask also: there is a LUT in C4D you can use to see you render as sRGB, even if, of course, you’re actually working in Linear? How set it? The last question is about Alpha channel. In other 3D software, all passes have always an Alpha channel (default). In C4D I thought it but I verified at the end render that all passes weren0t without Alpha channel. Aughhhhhhh… I composite them anyway using Object buffer, but really I would not do it any more: I need alpha channel in all multi pass I make! So, in Render setting, what I have to do to have an Alpha channel in every passes? About importing linear render passes in AE, You should create a 32 bpc comp, and in Project setting / Working space, set sRGB , Linearise Working Space so that AE ‘ll work in Linear. So, when you say: “When you bring this into AE it is interpreted as sRGB (linear). sRGB has a gamma curve of 2.2 to better display colours on screen, sRGB (linear) is the same colour gamut without the gamma curve, so the curve is linear or 1.0 ” you mean that AE applies an automatic LUT to see in sRGB, but in fact he works in linear ? This is a crucial argument! I’m having problems getting my output 8-bit png (and other formats) files to look the same as my composite. This has never been a problem in Nuke. I’ve set my working space to sRGB IEC61966-2.1 with linearize working space checked. I would expect the output profile in the Output Module Settings to be sRGB IEC61966-2.1 with “convert to linear light” off, but this just doesn’t produce the correct results. What am I doing wrong? @Mikael Try using a different format, PNG doesn’t seem to work well with C4D & AE when using Linear Workflow, I have had the same problem, switched to PSD (16 bit) and all was ok. Not sure if it is a bug with PNG, C4D or AE, but choosing an alternative file format should solve your problem. HI,I have a question that the render images in “Picture viewer” in C4D is the same when the”image color profile” sets to different in “Render Settings”. I think the render image should be different as the color profile is different. Can you explain it? 1.Enable the “Linear Workflow” in “Project Settings” by check the box. 2.”Input Color Profile”is sRGB in “Project Settings” . 3.The “Image Color Profile” sets to “sRGB” and “Linear Color Space” respectively. 4.Render the different settings, the result is same. I think if the colour profile is being read correctly then the images should look the same, I think the picture viewer is reading the profile correctly and displaying the image. If you open them in Photoshop and there is no embedded profile then they will look different, but when you assign the correct profile then they should look the same?